Our C Frame Presses are available in 12, 25, 50, 75, 100 ton, and our new 150 ton models. 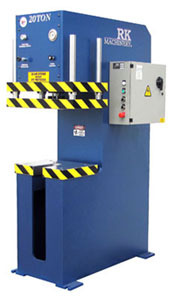 Our presses are built with dual controls which enable operators to select from either a moveable pedestal complete with dual electric palm buttons and extra emergency stop, or a foot pedal. See the complete specs to review the wide range of other standard features. and available throughout North America. Jog mode used for simplifying setups. Quality BALDOR motor, low speed. Standard U-Slot table can quickly be removed for another table to better suit your needs. Moveable pedestal height for comfort and ease of operation c/w dual electric palm buttons & extra emergency stop or Foot pedal. Based on your needs and specifications we will custom build your hydraulic presses ensuring that the hydraulic C frame press you purchase will help you succeed. 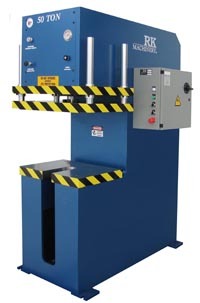 For exact specifications and additional options for each specific model please access the PDF document for more information on our hydraulic C press. RK Machinery the C frame hydraulic press manufacturers.